The potato belongs like tomato, pepper and tobacco to the nightshade family. The green parts of the potato are also toxic. Potato plants can get next to tubers also berries which, unlike those of the tomato are highly toxic. The tubers become poisonous and green when they get light. Some well-preserved tubers from the coastline of Peru reveal the origin of the domesticated potato. Which of the 150 species of Solanum was the father of our potato is no longer to find out. The underground stems (stolons) swell at the tip to new tubers. Under the potato is the scar of the dried root still visible. At the top are one or a few eyes. The other eyes are situated on a spiral line from bottom to top, with each 5th eye again situated just above the first. (Like the leaves on the stem implantation have a leaf divergence of 2/5: five vertical rows where the leaf after two spiral turns is back above the initial one). Between 1843 and 1847 spread the fungus Phytophthora infestans and destroyed the Irish potato crop. The great Irish famine (Great Famine, also Potato Famine) also brought cholera and typhoid. 1.5 million Irish people died, millions emigrated. The population dropped from 8 million in 1840 to around 3.5 million in the early 20th century. Seed potatoes can be bought in size 25-35 (mm). They form less stems, but larger potatoes. 28-35 is fine: they make lots of eyes and count enough pieces per kilo. 35-45 provides many potatoes, but smaller. When you harvest potatoes, you can keep the little ones as seed potatoes. Especially those with many dimples and eyes: each eye produces a stalk. Large specimens can be cut, which brings 20% more stems than uncut tubers. Cut best on the smallest edge. Cutting supplies according to tests at least 10% more yield. You can briefly press the cut wound in wood ash to dry the cutting faster. Even 5 weeks before planting, you can already cut. Allow the wound to dry before planting, but let the seed potato not dry out or rot. Even peels with one eye may still shoot. Giving you already can find potatoes in the compost heap. Conventional plant distances are 70 x 30, 60 x 35, 60 or 50 x 40 or 50, or 28 to 36 cm in the row. Make sure you have enough space between the rows to work (earthing up). Estimates for size 28/35: 40 tubers / kg, 3.5 stems / tuber, about 8m2. size 35/50: 16 tubers / kg, 2.5 stems / tuber, 5m2 (doubled by cutting). 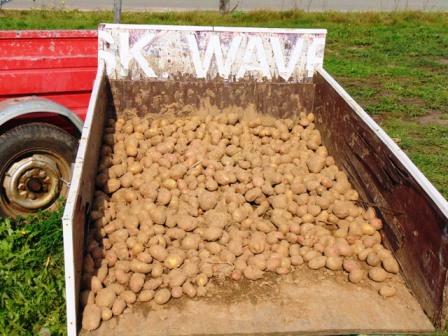 Potatoes produce at least one kilo per seed potto, or up to 45 tonnes / ha. Under the influence of light and heat (+10°C), the potatoes sprout. Let them quietly grow 1cm long, and try not to break them while planting. Potatoes you can easily keep a winter. Let them shoot in spring. Each sucker is a stem. Seed potatoes are planted in April. Do you have too few such seed potatoes, you can cut them each and allow the interfaces to dry. Each item must have at least one eye. The tubers grow underground. So plant them deep enough into loose soil. High the seedbed regularly with earth, so you get more tubers. Or plant them deep enough. You can also plant them in drained (perforated) barrels and regularly add ground. Then you get a whole bunch of potatoes from one bush. You can also use tires, and each one put on top. Personally I do not like the idea, nor the smell. In car tires are heavy metals (zinc, cadmium and lead), black carbon, sulfur, para-phenylenediamine (allergy inducing material), polycyclic aromatic hydrocarbons (PAH), volatile substances comparable with certain petroleum fractions. They leach into the air, water and soil. Using them in the garden (and construction, tiles, toys) is a bad idea. If the foliage begins to die, you can scatter the potatoes. Grubbing potatoes (and other types of tubers) is hard work. You cannot see the bulbs so you have paw the ground several times haphazardly with a fork to get all of them. There may rest for several hours to dry a bit. A handy tool to collect them is the potato basket, also called harvest basket or wire basket. A solid metal wire basket. Nowadays, they are sometimes still used to carry food to the horses in riding schools, and smaller specimens also on golf courses in order to collect golf balls. The advantage is that the harvest in the airy basket can dry further, and that when manipulating (wearing, putting) the soil of the tubers can come loose and fall through the openings. As through a coarse sieve. The Colorado potato beetle is an enemy to be feared, yellow with 10 black - brown stripes. He sits on the leaves and lets himself fall when you hit the bush. Small orange eggs stick in groups of 15 to 80 under the leaves. The larva is reddish. It is an endless and hard work to catch them off. But he screws up your harvest. For those who are not aware of the (kitchen) secret: if you bake potato sticks in hot oil... you get fries! French fries are potatoes cut into bars from 1.5 mm to 20 mm (thick), which are baked in fat or oil (2x). The pre-baking is done at approximately 145 ° C (slow cooking and wasting of moisture). Then let the chips rest for at least half an hour and then bake in 180 ° C.
Gastronome Jo Gérard writes that around 1680 small fish from the Meuse were fried in Namur, Andenne and Dinant. In frosty periods these were replaced by sticks of potato. Doubt is justified because potatoes in this region were only available around 1735, and oil and fat were too expensive to use for frying. Starch (C6H10O5)n ) is the main source of carbohydrates in the diet. It is a plant food reserve found in rice and others cereals, potatoes, some carrots (cattail, tapioca...), legumes. There are two main types: amylose and amylopectin, two polymers of glucose, both made ​​up of glucose molecules. The starch in raw potatoes is packaged in granules (vesicles, packets with their own membrane) so that it is not accessible to the digestive enzymes, it is resistant starch. The granules are insoluble in cold water. During cooking the starch granule gelatinizes and the content amylose and amylopectin is made free. Gelatinization occurs over a wide temperature range. The complete gelatinization demands high temperatures and plenty of water. The result is a starch paste which it is easily digestible. Upon cooling, the starch molecules re- crystallize, and they are less accessible to the digestive enzymes. Also good chew (influence of saliva) helps with digestion. Cooked and hot eaten rice and potatoes provide more energy (or calories), so do not let it cool down or warm it up. Eating raw potatoes involves a lot of undigested starch in the large intestine where it is fermented by the present bacteria. Thereby raw potatoes cause flatulence (wind), and sometimes stomach cramps or diarrhea in many people. There is also a 'Blue potato” with a purple - blue inside edge (which is not disapearing when cooking or baking). Even a redish. Vitelotte, also called Vitelotte noire, Négresse or Truffe de Chine, is a gourmet French variety of blue-violet potato. Potato: ' Why are you crying? " Little one: "My mom is mashed." It is sometimes said that potatoes, and certainly potato peels would be toxic. That's only right when they are exposed to light and therefore become green. The green parts contain (more) toxic solanine. Solanine is produced to prevent mold and damage by insects and worms. Solanine is very heat resistant and is not broken down by cooking. However by heating the solanine content is lower. One part dissolves in the liquid, which therefore is no longer used for further preparations. Poisoning usually occur at 2.5 mg alkaloids per kg weight per day. That is for someone of 50 kg so 125 mg, given in 1.8 kg of unpeeled potatoes or 4 kg peeled potatoes. So no one eats that. You can still cook potatoes in the skin without risk, or put in aluminum foil on the grill. And eat the peel or scrape, or (cooked) peel them, or (uncooked (thin)) peeling. I have a long time collected peels at a chippy for the pigs. I cooked them outside on a wood fire in an old canning kettle. But they like them raw, too. "When I was young and poor, I ate soup and potatoes. Now consommé and potato gratin."